Toronto, Canada, April 17, 2018 – Lingo Media Corporation (TSX-V: LM; OTC: LMDCF; FSE: LIMA) (“Lingo Media” or the “Company”) a global provider of digital and print-based English language learning solutions, is pleased to announce that its wholly-owned subsidiary ELL Technologies Ltd. (“ELL”) has completed the installation of the first ELL LAP. 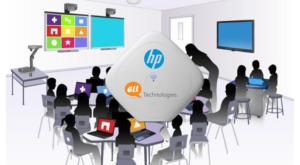 The ELL LAP is a Learning Access Point, a device pre-loaded with our educational software that creates a wireless local network and brings connectivity to the classroom without the need to connect online to an ISP. This inaugural project at the Universidad Autonoma de Chiapas in Mexico is part of the company’s strategic alliance with HP Inc. (NYSE: HPQ) (“HP”). The ELL LAP installation will enable offline learning for ELL Technologies’ Campus English language learning program for students at the university through its multi-room deployment.